Curtailment in the Irish power system. The fact, that the production of wind energy has no time correlation with the regular pattern of electricity demand leads to mismatches between the available wind energy and the conventional generation. These mismatches lead to increased fuel consumption in the conventional system and situations where wind energy cannot be absorbed in the grid. The first effect implies, that stated fuel or CO2 savings by wind energy are not attained. The second effect caused by the stochastic nature of wind receives much less attention at present. This is wind energy curtailment. Wind energy has priority dispatch in nearly all electricity distribution grids, so the grid operator needs to adapt the conventional production to the level of wind energy produced. This is impossible in situations of high winds and low demand, so the windmills have to shut down partially. This is called wind energy curtailment. This effect starts to show at wind penetrations around 10%, if the grid in question does not dispose of a significant amount of energy storage. Presently large-scale storage of electricity can only be done by pumped hydropower. The flexibility of the conventional system plays an important role as well. In Danmark one has installed wind energy and in parallel all conventional generators have been transformed in combined heat and power units. (CHP). This implies, that in winter the running of the generators is largely determined by the heat demand. P.F. Bach has shown, that Danmark has to export nearly all of its wind power to Norway during the winter. Figure 1 taken from ref. 2 illustrates clearly the correlation between electricity export and wind energy production. The wind production is 20% of the total demand averaged over a year, but less than half of it is absorbed in the Danish grid. Curtailment starts to bite into the profits of the wind turbine owners, if they do not get compensation for the forced stopping of the mills at high winds and low demand. In England the compensation is really generous, so nobody in the wind industry cares about curtailment, because it is the consumer who has to foot the bill for stopping windmills to produce excess energy. These generous compensations do not exist in Ireland, so there a hot debate is raging over the distribution of the burden. The peak demand in the Irish grid is between 3 and 4 GW and the low demand is between 1.8 GW and 2 GW. The conventional generation has a capacity of 6.7 GW, so even without wind there is a significant over capacity. An important element is the adaptation possibility of the Irish grid by the presence of 200MW hydropower and 270MW pumped hydro power. Recently 1,6 GW wind capacity was added to the grid, while the government announced plans to increase the wind energy capacity threefold before 2020. This article discusses some consequences of this transformation of the Irish electricity supply. 2. Analysis of the 2011 data. Eirgrid is publishing operational data every quarter of an hour, so one can look there for curtailment in real data. 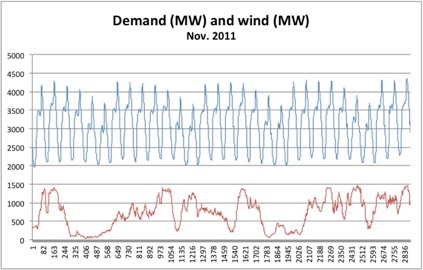 Figure 1 shows a plot of total demand in MW and produced wind energy in MW during November 2011. Close inspection of the wind curve shows frequent dips in the wind production occurring during times of low demand. Demand and wind energy production as a function of time in units of ¼ hour. Curtailment occurs mainly at periods of low demand, so we rearrange the 2880 data points of wind production and total demand in order of decreasing demand. The data points of figure 1 arranged in order of decreasing demand. The curve of decreasing demand is weakly correlated with the time of the day, as high demands occur during the day and low demands occur during the night. 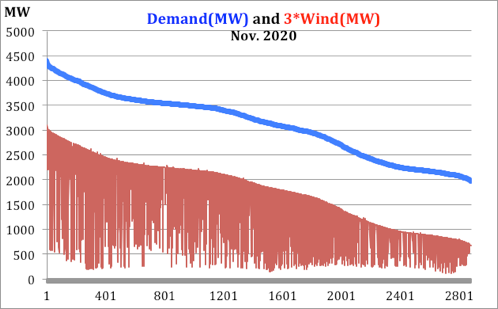 The upper curve starts at 4300MW, a daytime point of highest demand, and runs down to 2000MW some time during a weekend night in November 2011. As wind is uncorrelated with total demand the recorded points of wind production show no structure. One feature is clear however: at low demand the thickness of the red band diminishes and starts to follow the demand curve at a constant distance. This is curtailment and the conclusion from the distance between the demand curve and the band of wind production is, that the operators started to cut into the wind production if the demand for conventional energy became less than about 1300MW. This 1300 MW is the “must run” production in the Irish power grid. This “must run” production is well below the minimum demand in the system, which is around 1900 MW. It is clear, that the amount of curtailment is critically dependent on the “must run” power level of the conventional system compared to the minimum total demand. In the following discussion we use average production instead of total production as the numbers for different periods of time can thus be compared without adjustment. 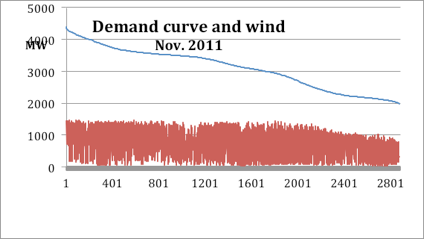 Figure 2 shows, that there is little or no curtailment in the first half of the demand curve, so we calculate the average wind production from the first 1500 points. The result is: 815 MW. We assume, that this number contains no curtailment although we have no proof of this assumption. Next the average wind production is calculated over all 2880 points. The result is: 736 MW. 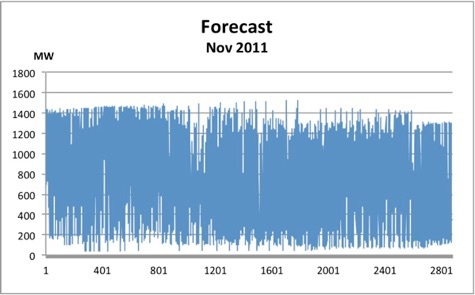 The difference 815 - 736 =79 MW is an indication of the curtailment in November 2011. This calculation neglects a possible day/night effect in the wind energy production. The points of lowest demand occur always during the night, so a day/night variation of the wind force could cause a similar effect. This can be checked against the wind production forecast, which is also given in the Eirgrid tables. There is indeed a day/night effect, so the curtailment reduces from 86 MW to (755 – 736) = 19 MW. This amounts to 2,7% of the average wind energy production. We noted before, that the curtailment is extremely sensitive to the amount of must run production compared to the minimum demand. We increased artificially the must run production to 1900 MW. The curtailment rose from 2,7% to 17%. This number varies from month to month, due to the changing nature of the wind and because the composition of the conventional generation is not constant. Hydropower makes a grid much more flexible, so the required minimum of conventional generation might vary. This implies, that although the calculation is straightforward without any assumptions, the results are different from month to month. The results for the year 2011 are calculated by taking the average over the 12 months. The numbers for the first 1500 points show the consistency of the results. Figure 4 illustrates the procedure. 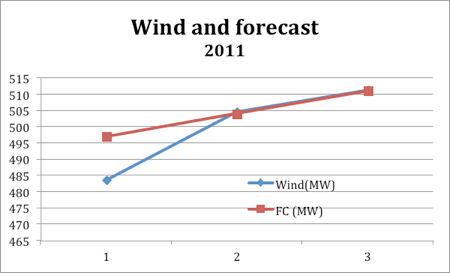 Figure 5: Wind production and forecast. Figure 5 shows the points. Point 1 are all 2880 points, point 2 are the points 1 to 2000 and 3 are the points 1 – 1500. The forecast is normalized to the data at point 3. 3: The consequences of tripling the wind energy. The wind curtailment in 2011 was small, but the Irish government announced plans to triple the production of wind energy towards the year 2020. This would increase the wind contribution to 50%. If this plan is realised, there will be certainly not much room for investments in the conventional generation in the coming years, so we assume, that the conventional capacity will remain the same. Tripling the wind capacity is simply simulated by multiplying all wind production numbers by three. This procedure guarantees the “must run” margin for the conventional system. Figure 5 illustrates the result of the procedure. The red band follows the demand curve now everywhere, so the curtailment occurs now during all times of the day, even at peak demands. We take the original average value for the wind energy production and multiply this number by 3 to arrive at an expected wind contribution. We compare this number to the average wind production in the curtailed situation. This procedure is also done for 2 times the present wind capacity. 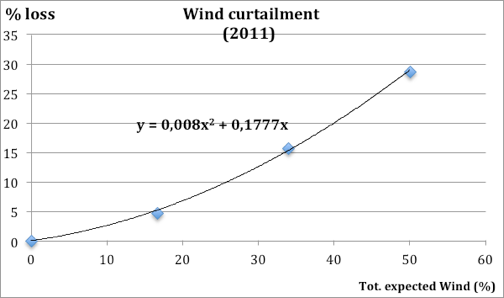 the wind energy curtailment loss as a function of the expected wind contribution. The data of figure 7 tell something about the influence of the wind on the running of the conventional generators. Figure 6 presents the case of 50% intended wind, but figure 7 tells us that the real contribution is not more than 35% because 1/3 of the wind energy cannot be absorbed in the grid. One can also derive from the data of figure 5, that the conventional generators are pressed to deliver not more than 1500 MW during 47% of the total time. The lower edge of the red band indicates that during a large part of the time not more than 200MW wind is available. This implies, that at least 4 GW conventional power should be standby to cope with these minima, but at the same time these generators are not allowed to produce more than 1500 MW. Modern CCGT units are advocated as the ideal backup generators for wind energy. One has to realise, that the recommended operating range of a modern 59% efficient CCGT unit is between 60% and 100% of its maximum power. At power levels lower than 60% of the maximum the efficiency lowers nearly linearly with the power level, This implies, that the must run power level needs to be adjusted to this requirement and the curtailment will be above the levels calculated from the simple extrapolation presented here. Reference 1 shows, that the efficiency is seriously affected at present levels of wind penetration, so it will be disastrous at three times the actual wind energy contribution. This analysis shows, that wind contributions above 20% become very unpractical. A wind capacity, that should deliver 50% of the Irish demand for electricity, will in reality only contribute 35% to the total production. It should be noted, that in extrapolating from the present situation we have neglected any grid congestion issues, which undoubtedly will occur. Even with a considerable grid expansion our curtailment figures should be considered as minimum values. Even if the grid were reinforced sufficiently to solve congestion, one still will have to live with a 30% loss of wind energy through curtailment. A second remark is that the Irish grid is very flexible due to the absence of CHP installations and the presence of 470MW of hydropower. Other grids (England, Holland, Germany,Danmark) have much less flexibility, thus the curtailment losses will be much higher. The experience in Danmark shows, that already at 20% wind energy, export is the only way to get rid of half the wind energy. This solution is unique to Danmark as all other countries will be surrounded by windmills of their neighbors. 5 Recommended by the maker of 5 CCGT units located at Eemshaven.